The following are the terms used in Gears. During the design and calculation of the gears these terms are considered. Pitch Circle Is an imaginary circle where two gears will meet as two cylinders with Zero friction. It is an important parameter because pitch Circle diameter is used to define the size of the gears. It is simply the diameter of the Pitch Circle. The point where to Pitch Circle meets is referred as pitch point. The surface at the pitch point of the Rolling cylinder replaced by meshing gears. Angle between the common normal to the point of contact of two gears and the common tangent in the Pitch Circle. It is also called obliquity. The standard obliquity are 14½° and 20°. The radial distance of a tooth from the Pitch Circle to bottom of the tooth is called dedendum. A circle from the bottom of the tooth which is Cocentric to the Pitch Circle. The radial Distance from the top of the tooth to the bottom of the tooth in a mating gear is called clearance. Distance between addendum circle and dedendum circle or the sum of addendum and dedendum is called full depth. Distance between addendum Circle to the clearance circle is called working depth. The thickness of tooth along the Pitch Circle is called tooth thickness. The space between two consecutive teeth along the Pitch Circle is called tooth space. The difference of toothpaste and tooth thickness is called backless, or in a meeting gear the space between two teeth is called backlash. 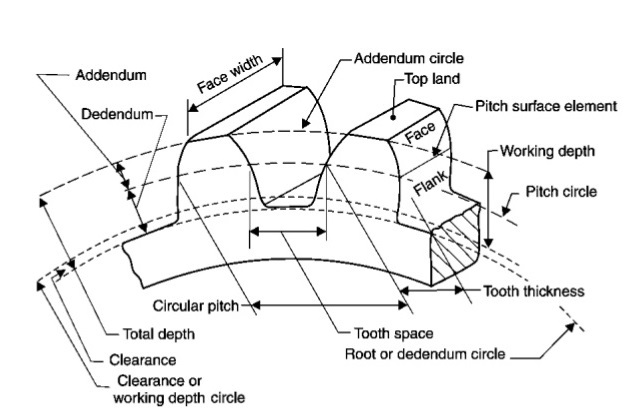 The surface of tooth above the Pitch Circle called face of tooth. The surface below the Pitch Circle is called flank. The top surface of a gear is called topland. Width of the tooth parallel to the gear rotation axis is called face width. In The root of a gear teeth a fillet is provided. And the radius That connect the root circle and profile of the tooth is called fillet radius. It is path of point of contact of two mating gears from beginning to the end of the gear meshing. In the mating gear the path of a point on the pitch circle is called arc of contact. It is a path of a point on pitch Circle of mating gear from the point of engagement to the pitch. Path of point on Pitch Circle of two mating gears from the point of disengagement.